Tomatoes are harder to grow, especially if there are any hungry brushtail possums around. Cherry tomatoes are probably the easiest of the bunch. You can get tomato seedlings coming up in your mulch from the seeds of tomatoes you got from the supermarket. I am growing most of my tomatoes in a bathtub with a birdmesh cage on top to keep out the possums, scrub turkeys and other birds. This also helps to save on water. Many people recommend that you remove all the side stems from a tomato bush. This seems to increase the size of the leaves and the fruit, and makes the fruit ripen faster. You get a few larger fruit spread out in time, rather than a big crop of small fruit just before the bush dies. You can use these stems for grafting, or simply plant them in the soil. If you keep the soil moist enough they will grow. Special feature: an illustrated guide to grafting tomatoes and eggplant onto wild tobacco. A cherry tomato is a smaller garden variety of tomato. It is marketed at a premium to ordinary tomatoes, and is popular as a snack and in salads. Cherry tomatoes are generally considered to be similar but not identical to the wild precursor of the domestic tomato. They are often sweeter than standard tomatoes. 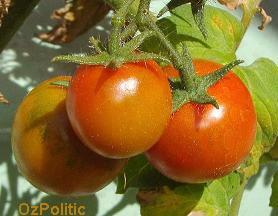 The cherry tomato has 24 chromosomes, and its scientific name is Solanum lycopersicum cerasiforme. There are a number of cherry tomato varieties. The Santorini cherry tomato is cultivated in Santorini (Greece), and is known for its flavour and body. International conferences dedicated to the cultivation, horticulture and agriculture of the cherry tomato are also held at Santorini. Another popular variety often grown in American gardens is Sweet 100, named for its flavour and prolific production. The number after each variety is the days to maturity. See below for more terms. Goliath -- 85 days -- heirloom -- largest known tomato, up to 48 ounces! Super Fantastic -- 70 days -- VF -- hybrid -- heavy producer of large, smooth, round fruit with a good balance of sweet and acidic. Three Sisters -- 75 days -- 6oz fruit -- Potato leaf -- This breed actually can bear any one of three types of tomato: A single-pleated variety, a roma style, or a pleated, flattened fruit. Green Bell Pepper -- 76 days -- not actually a green pepper, but shaped and coloured like one, inside and out. Tastes like a tomato. New Big Dwarf -- 90 days -- 16oz fruit, been around 90 years, illustrating why you should never name anything "New..."
In biology and especially botany, indeterminate growth refers to growth that is not terminated in contrast to determinate growth that stops once a genetically pre-determined structure has completely formed. Thus, a plant that grows and produces flowers and fruit until killed by frost or some other external factor is called indeterminate. 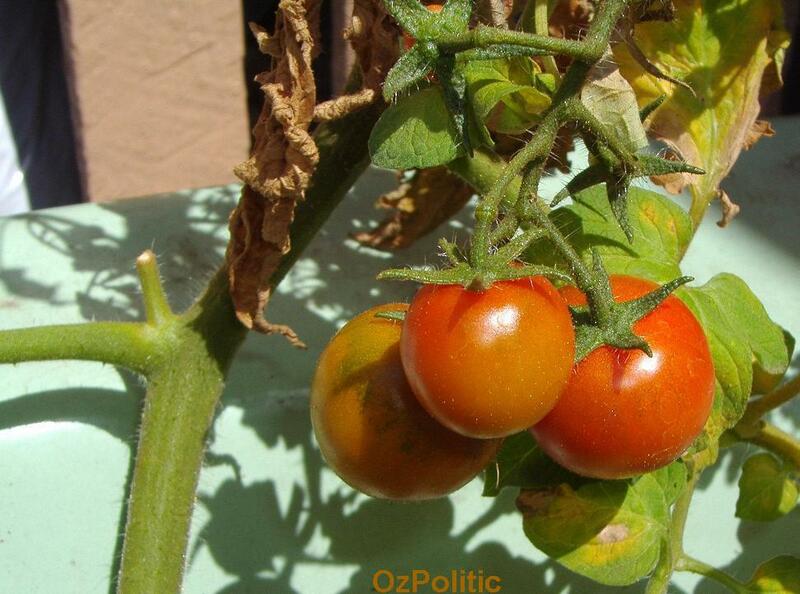 For example, the term is applied to tomato varieties that grow in a rather gangly fashion, producing fruit throughout the growing season, and in contrast to a determinate tomato plant, which grows in a more bushy shape and typically produces a single harvest. In reference to an inflorescence (a shoot bearing flowers), an indeterminate type (such as a raceme) has the flowers developing and opening from the base towards the growing tip. The growth of the shoot is not impeded by the opening of the early flowers or development of fruits and its appearance is of growing and producing flowers indefinitely. In a determinate inflorescence, typically all of the flower buds are formed before the first ones begin to open, and all open more or less at the same time; or a terminal flower blooms first and stops elongation of the main axis.